Crowd Companies’ member organizations consistently work to overcome challenges while leading their teams in adapting to, and thriving within, the Collaborative Economy. Their efforts to connect with new the crowd behaviors have not gone unnoticed. At the Crowd Companies “Main Event” in San Francisco on Oct. 6-7, we presented awards to five member companies that have exhibited excellence in the creation and execution of Collaborative Economy programs. The following companies have proven ROI as a result of their dedication and initiative deployment in the areas of on-demand integration, crowd collaboration, brand innovation, and enablement of makers and marketplaces. Below are photos of Angus Nelson of member success and I, presenting awards at the council event. The On-Demand Integration Award recognizes Whole Foods’ partnership with the Instacart marketplace to provide on-demand grocery delivery services to its customers in 15 U.S. cities. Through this partnership, Whole Foods Market offers its customers the convenience of online grocery shopping, delivery, and pickup without having to handle the logistics themselves. Whole Foods’ partnership with Instacart has resulted in more than $50 million in sales from 160 stores nationwide, and in-store Instacart ads have created a higher lift of product sales. The Crowd Collaboration Award recognizes Swisscom’s utilization of the crowd to bolster its customer service efforts in a free online community. Swisscom Friends, run on Mila, solves customer needs by connecting them with nearby tech-savvy professionals to provide support for small product/installation issues. In a public interview, the company announced results from Swisscom Friends, including: offloaded support requests from traditional customer service department, enhanced self-care, increased customer satisfaction, and the potential for low-pressure sales upgrades. BMW: Brand Innovation Award with DriveNow Car Sharing Program. The Brand Innovation Award recognizes BMW’s provision of car-sharing services through its DriveNow program. Members of BMW DriveNow use the brand’s mobile app or website to locate BMWs (fueled and electric) available for on-demand rental within the business districts of San Francisco, Vienna, London, and many German cities. By actively becoming a supportive member of the Collaborative Economy, BMW has publicly indicated that the German DriveNow car-sharing program is profitable. The Maker Enablement Award recognizes Autodesk’s empowering the Maker Movement from the CEO on down through offering access to its design software, tools, and programs to the creative masses. Through providing free software and curriculum to schools, educators, and students; offering 17 personal design and creativity apps; inspiring maker communities through Instructables and Creative Market; and offering an artist-in-residence program at its San Francisco workshop, Autodesk has showcased its commitment to furthering the power of makers to design, build, and innovate. The Marketplace Enablement Award recognizes Intuit’s commitment to the rapidly expanding marketplace of freelancers and independent contractors within the Collaborative Economy. Its launch of QuickBooks Online Self-Employed enables contractors to manage business and personal finances, handle taxes throughout the year, and easily meet compliance requirements, including with partnerships with a variety of organizations in the ridesharing space, and Peers. Congratulations to all the well-deserved winners! We look forward to seeing our members mature and deploy in the coming year and plan to continue our awards in 2016. Above: Version 1.1, with updated data. Version 1.0 is available here. Collaborative Economy valuation is through the rainbow-beaming clouds. These highly funded, fast-growing, media-hounded startups are the portfolio darlings of any venture capital firm, while this crowd-based, on-demand, collaborative category enables people to access resources from peers using efficient mobile devices. The Collaborative Economy market has received a total of $25 billion in investor funding, but not all companies are equal. 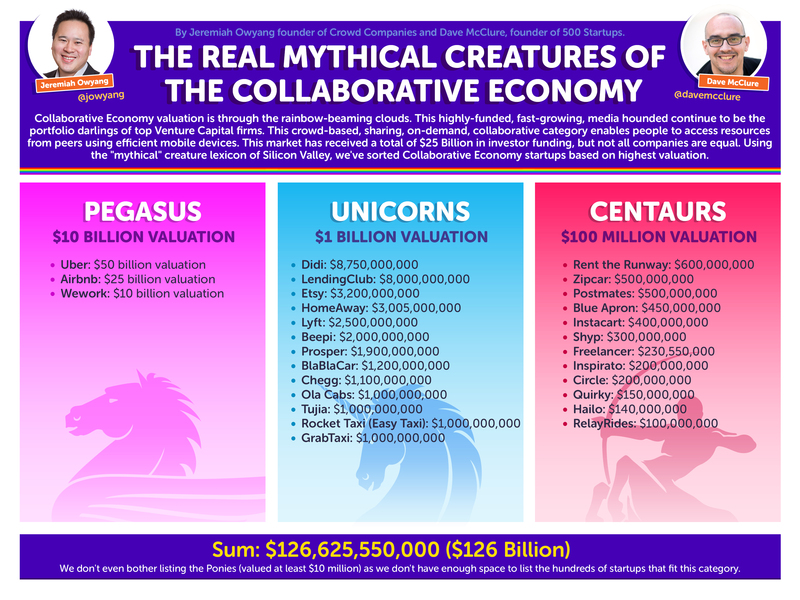 Using the “mythical” creature lexicon of Silicon Valley, we’ve sorted Collaborative Economy startups based on highest valuation. We didn’t even include the “Little Ponies” that are valued at $10 million – $100M as the list would be in the hundreds. Working with VC Dave McClure of 500 Startups, who has been championing a number of these fun terms, we constructed this handy little chart so you could see which startups have achieved high valuations. Is this space over-funded? Over-valued? I’m sure that’s the case for some of these companies, as frothy tech markets are a normal part of the startup scene. The difference between these startups and prior years is that they are generating revenue from every transaction. In fact, most startups take a 10 to 15% cut from every transaction in the marketplace. One danger of over-valuation means that acquisition becomes near impossible, with the most obvious exit being an IPO. If the valuations are incorrect, kindly leave a comment below, and I’ll amend the database. We plan to eventually publish an updated version. Massive database of Collaborative Economy funding (see multiple tabs). All my analytics posts on the topic of funding. Dave McClure featured on TechCrunch: Unicorns, Centaurs, and Dinosaurs. Forbes: What Bubble? The Unicorn Boom Has Just Begun. Silicon Valley lingo is getting pretty ridiculous: Unicorns, centaurs, and ponies. Rant: No really, SF Lingo is really out of control. The biggest shift in the business landscape since the Internet continues to grow—and established, traditional companies need to act soon in order to compete. That’s one of the key findings in The New Rules of the Collaborative Economy, a report I co-authored with tech researcher Alexandra Samuel, released today. The report is an update to Sharing is the New Buying, a 2014 report that, for the first time ever, mapped the prevalence of the collaborative economy and its impact on the business world. You can download the full report The New Rules of the Collaborative Economy, at no cost. What is the collaborative economy? The collaborative economy is an economic movement where common technologies enable people to get the goods and services they need from each other, peer to peer, instead of buying from established corporations. You don’t have to look very far to see how disruptive the collaborative economy has become. Today, the world’s largest hospitality brand—Airbnb—owns not a single room or hotel and is worth $25 billion. Uber, valued at over $50 billion, is the world’s largest taxi service—and it doesn’t own a single vehicle. Barely four years old, the online grocery shopping service Instacart is already worth $2 billion. 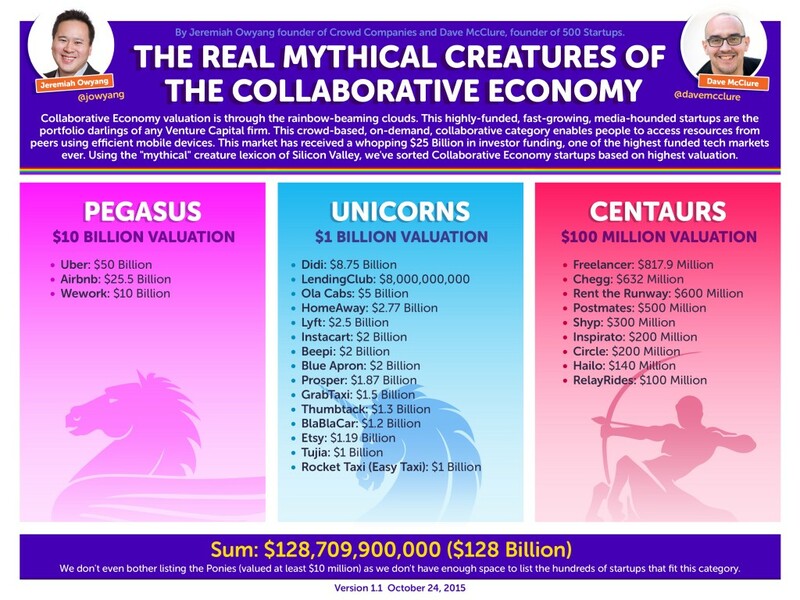 Overall, the collaborative economy has produced 17 billion-dollar companies and 10 so-called unicorns. Collectively, sharing startups have already received $15 billion in funding—surpassing the social media space that spurred giants like Facebook, Twitter and LinkedIn. How big is the collaborative economy? In one word: massive. We used Vision Critical’s customer intelligence platform and discovered that at least one in five customers now chooses sharing as their initial preferred option. The past year alone has seen an impressive growth in the collaborative economy. In North America, participation in this space has grown by 25 percent. More than 110 million people in the U.S. and Canada have participated in some form of sharing in the past year. The collaborative economy encompases many different categories and different forms of sharing. Last year, we looked at 11 categories; this time, we explored 13, adding online learning and Bitcoin to the list. It’s worth noting that all categories that we looked at this year have seen some growth in participation—reiterating the impressive growth of this movement. The following inforgraphic is a portion of the full report, which you can download at no cost. Is sharing here to stay? To determine the staying power of the collaborative economy, we asked people who stopped using sharing services in the past 12 months why they did so. In every category of sharing, about 2 to 6 percent of sharers report skipping that form of sharing in the past 12 months even though they had previously tried it, so we asked them why. Is it due to disenchantment with the sharing movement? What we found is that people who stopped sharing in a certain category are doing so not because of dissatisfaction but because of experimentation. Indeed, 70 percent of people that have used a given form of sharing (but not in the past 12 months) say they’re likely to try that form of sharing again in the future. And, in fact, people who’ve dropped out of one or more categories of sharing are the people most likely to be engaged in other forms of sharing. In other words, people are trying different forms of sharing, sometimes to the detriment of other categories. Dissatisfaction is not a factor. Where a sharer has given up on a form of sharing in the past year, only two percent of those instances are due to the sharer having a bad experience. Will the collaborative economy grow even more? Based on people’s intent to try different sharing services, we’re forecasting that eight in 10 Americans will be part of the collaborative economy by 2017. But the bigger threat for companies is this: as many as three in four traditional buyers have indicated that they might choose sharing instead of buying in the next year. For every person who has participated in a form of sharing in the past 12 months, there’s a new person who intends to try that type of sharing. The continued, rapid growth of the collaborative economy makes it clear that sharing is not a fad. Figuring out how to compete in this space is an urgent issue for companies today, and it’s one of the main reasons why I founded my company, Crowd Companies. To remain relevant, brands need to get closer to their customers and identify the business models that make the most sense for them. If you’re not yet feeling the effects of collaborative consumption, it’s only a matter of time. Sharing is disruptive and the companies that win in the collaborative economy recognize that they must change with and for their customers in order to thrive. Download the full report The New Rules of the Collaborative Economy to learn more.